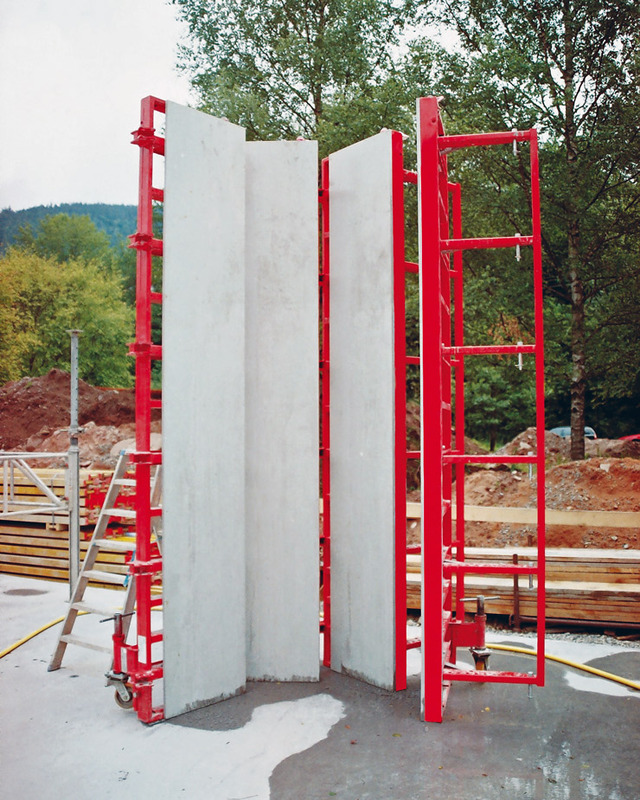 Novatec Formwork System’s column formwork, CaroFalt is available in 2 standard heights, 270cm and 360cm. CaroFalt consists of four identical panels with articulated links which are assembled like a windmill. It can be used with or without fillet strips to form either square or chamfered edges. The extension panels – available in heights of 60 cm and 120 cm – are added at the bottom of the standard panels with heights of 270 cm and 360 cm. This allows forming heights in increments of 30 cm. The extension panels are easily and quickly connected with two assembly locks. By adding the extension panels to the bottom, the integrated access platform and ladder do not have to be dismantled and re-assembled. 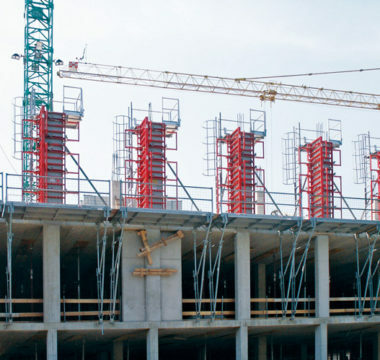 Once attached, all accessories remain in their position, regardless of if the height or the column section is adjusted. Thanks to the perforated rail it is easy and fast to adapt the column section from 20 cm to 60 cm in increments of 5 cm – square or rectangular. 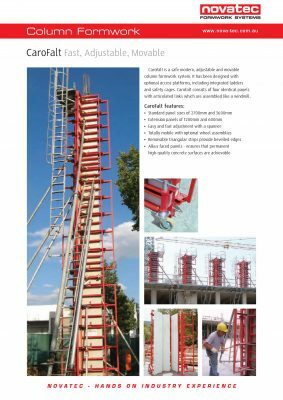 The integrated ladders and safety cages of the CaroFalt system have been designed in cooperation with the German Technical Committee for Construction, and they provide maximum safety for the assembly and the application of the column formwork. 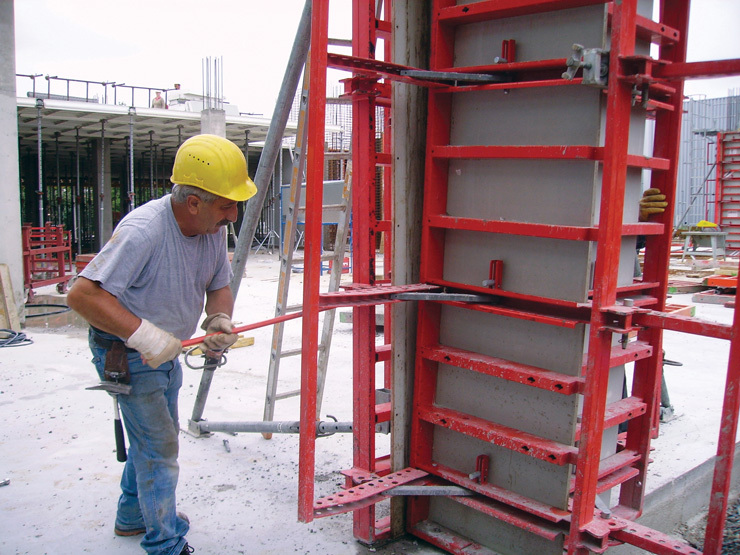 The CF Bracket serves to easily open and close the formwork – even from the ladder. After concreting the CF Bracket is loosened, the safety pin removed and the formwork can be fully released. 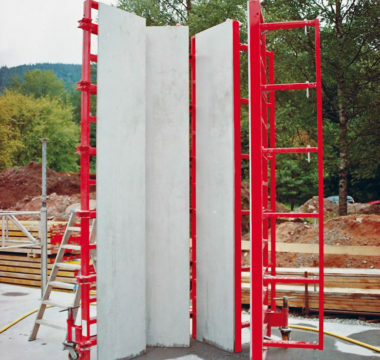 The panels of the column formwork are equipped with alkus-sheets. This forming face, made of a plastic composite construction, has the same lifespan as the panel frame. The alkus panel guarantees even and highquality finishes even after many reuses. 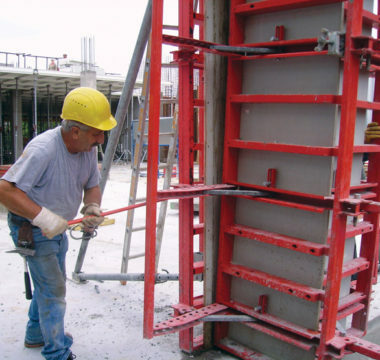 The complete formwork unit can be easily transported along the floor to the next position by means of transport wheels. 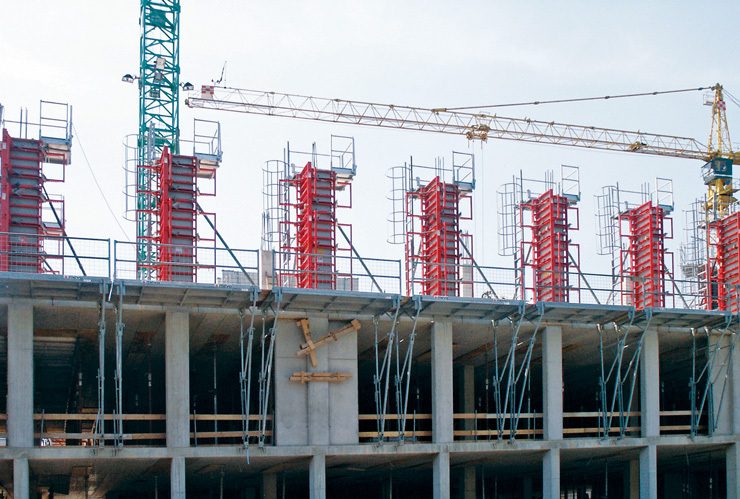 A crane is used for hoisting the CaroFlat to upper floors.